Weeds affect everyone in the world by reducing crop yield and crop quality, delaying or interfering with harvesting, interfering with animal feeding (including poisoning), reducing animal health, preventing water flow, as plant parasites, etc. Weeds are common everywhere and cause many $ billions worth of crop losses annually, with the global cost of controlling weeds running into $ billions. 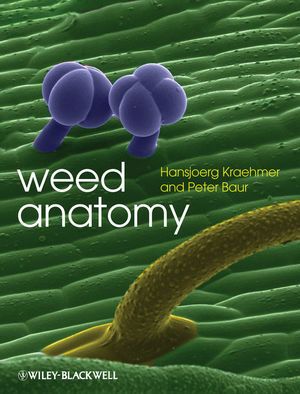 no single book has concentrated on weeds’ anatomical features. A comprehensive understanding of these features is, however, often imperative to the successful implementation of many weed control measures. the book’s covers. All libraries in universities and research establishments where agricultural and biological sciences are studied and taught should have copies of this exceptional book on their shelves. Hansjoerg Kraehmer is Past President of the European Weed Research Society and is based at Bayer CropScience, Frankfurt, Germany. Peter Baur heads the Competence Center Crop Protection, Clariant, Frankfurt, Germany. He is external Professor at the Faculty of Natural Sciences, Leibniz University of Hannover, Germany, and Past President of the International Society for Agrochemical Adjuvants.